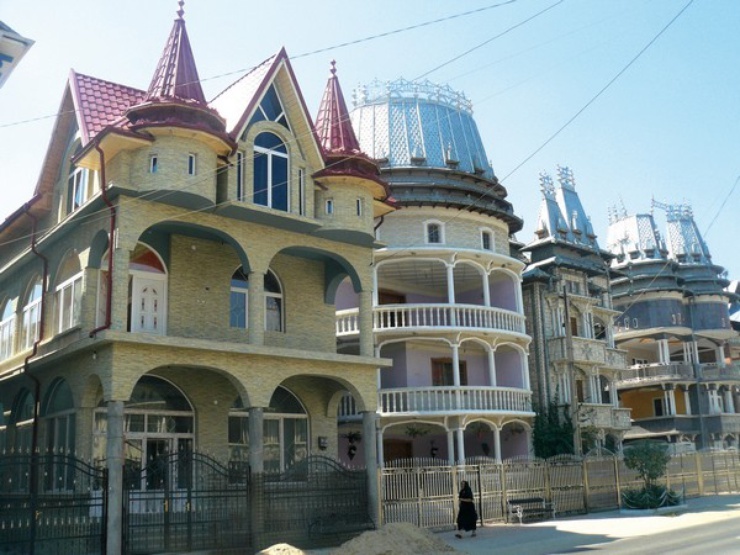 If you travel across Alexandria in the direction of Buzescu, you'll see rural houses with little vegetable gardens nestling on the left and right of the main street. It's quite a normal Romanian village. Suddenly behind the church, glistening high roofs with metal and tin towers dazzle in the bright sunshine. Mercedes stars on the ridge of the roof, pagoda after pagoda, silver flaking roofs: a mixture of styles carried to extremes. 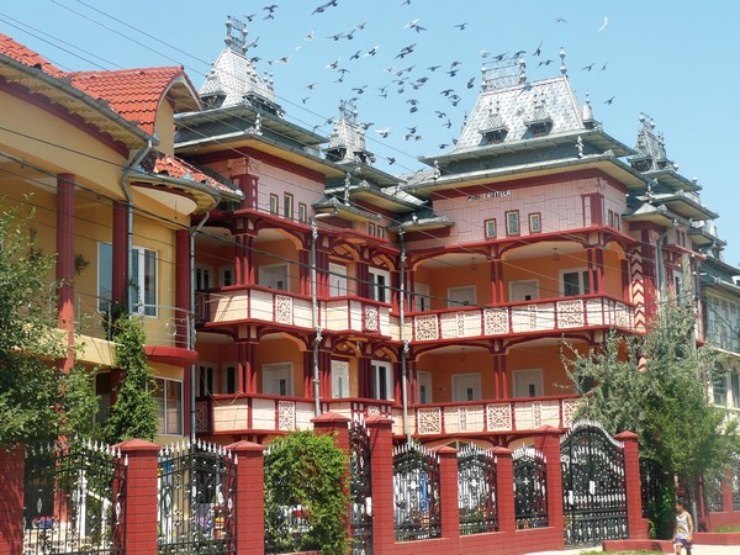 The orgins of the so-called Roma palaces in the style of pagodas lie in this small Romanian village. The artist-architect trio Mariana Celac, Iosif Király and Marius Marcu-Lapadat are the first non-Roma to have explained the phenomenon with their photo feature Tinseltown in 2001. According to Celac, a skilled town planner and critic of Ceausescu's regime, a variety of qualities which have been lost in contemporary architecture can be found here. A foreign landscape tears past outside – shepherds, villages and a lot of barking dogs. A few Romanian fellow travellers warn, 'You want to go to the gypsies?' 'Palaces? Forget it – unimportant kitsch totally lacking in style.' Coming from a thoroughly structured, orderly German city that sounds utopian. Is it a matter of innovative architecture? Maybe even of a new identity feature of Roma culture? It is noticeable that people are searching for something which sits alongside social boundaries. Marzipan pink marble, liquorice black tiles, concrete, precious metals, dainty columns, colossal horse shoes, dollar signs as ceiling lamps – we stand transfixed and out of place in the middle of the Rroma populated village quarter. Shapes that have never been seen before pile up on both sides of the street; in between the walls of houses huge capital letters made of flowers grow entirely without support. Fashion vanishes fast! 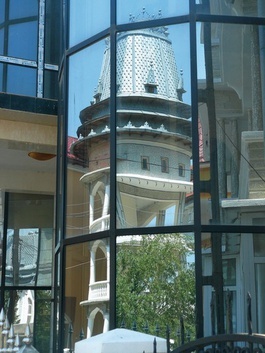 – Piled up against the once popular bus windows, mirrored facades and old pagoda roofs reflect each other. The village high street resembles a cat walk. Everything is constantly in flux, even the lorry racing past. People work between mountains of sand, cement mixers and improvised scaffolding. Every palace proprietor is his own client. 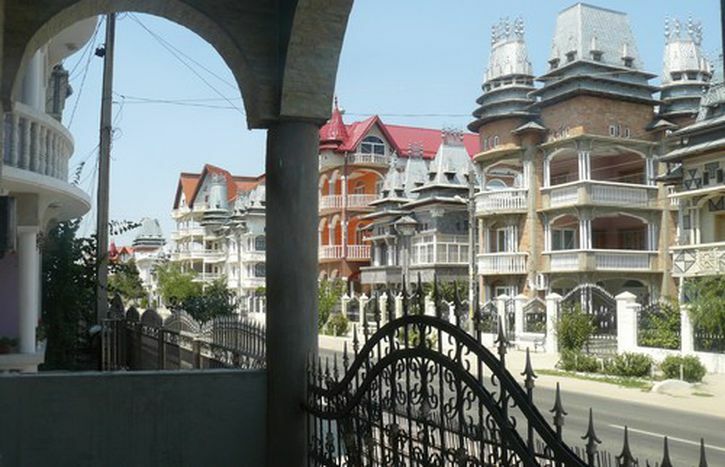 The aesthetic sources of the palaces stretch from administrative buildings in neighbouring Alexandria to the stucco which has been applied using genuine plaster templates from the megalomaniac dictator's palace 'House of the People' in the capital of Bucharest. Elements of a representational use of forms are being combined in new ways. A man with a straw hat invites us into his palace. He has always lived in Buzescu. Like most people here he belongs to the Kalderash tribe, the 'tinkers', and even today still deals in tin goods. We marvel at expensive Tuscan wall colours, immaculate plastic flowers, arranged gold vases and plush tiger skins. Everything is organised symmetrically. Mariana Celac recognises an important composition principle in this symmetry. Both inside and on the outer facades and exit staircases, no matter how varied the buildings are, the central axis is pronounced. 'They build it that way because they like it. That's much more effective and more deeply impressive than a rule imposed by the authorities or society.' Our host proudly tells us of his eight children's careers. Their names crown the roof of the house. Perhaps this type of construction, in which man and house stand in close relationship, has potential. Could it become a part of the Roma identity? Iosif Kiraly, Tinseltown photographer, speaks cautiously of a 'historical moment'. 'I think we find ourselves at a point in which a minority is newly defining its identity.' He believes that the palaces' architecture is a medium to express this identity. 'It is already typical that the most expensive construction sites and buildings are on the main street. These houses are for prestige purposes only.' It is an imposing architecture then. He points out that this actually the case for architecture in general, be it the Ceausescu palace or western European bank buildings. Within the roma there are very differing opinions regarding the question of identity. According to an important Rroma anthroposophist the palaces are 'yet another of the white society's stereotypes about the gypsies.' She claims it is a marginal phenomenon which has nothing to do with the real identity and frequent poverty of the Rroma. 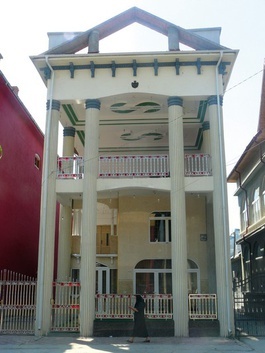 In the mean time there is a Gadje (non-Roma – ed) architecture office which imitates this type of collage style. The question remains: can this style be imitated authentically? The characteristic of Roma buildings is after all the constant flux, the changing state of the property.